Even non baseball fans may have heard Derek Jeter's name bandied around the last few days. He's just got 3000 hits something no other player in Yankees history has achieved and his jersey the old #2 is still one of the hottest sellers even fifteen years after I got my first road grey M #2 back in 1996. 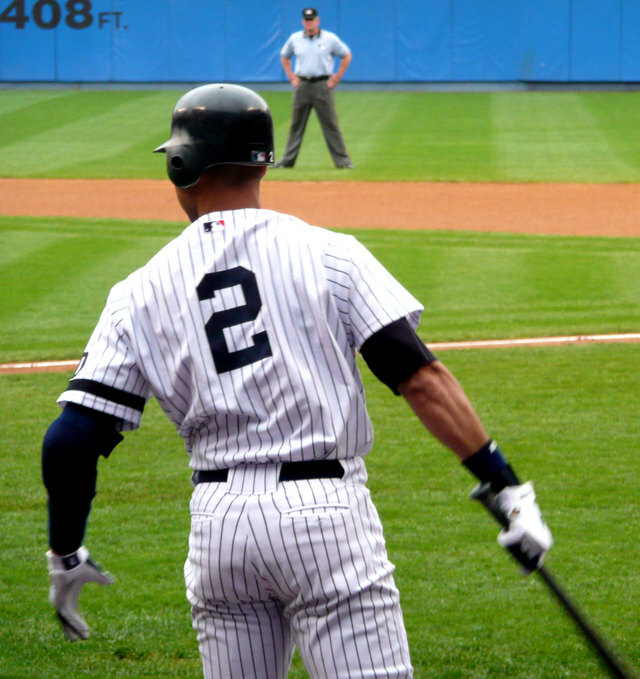 Nowadays I'd favour an XL home #2 without the name on the back (Yankees uniforms do not have names on the back so if you see someone wearing a Jeter #2 its not really authentic). But one question has been bugging me about this jersey. How did they give Jeter such a low number? Such a prestigious number? What happened? Here's this punk kid trying out for the team in 1995, what number should you give him for the back of his shirt, 55, 38? No, they come up with #2! Remember this: #1 is the retired number for Billy Martin; #3 is the retired number of Babe Ruth; #4 is the retired number of Lou Gehrig; #5 is the retired number of Joe DiMaggio. It gets worse: #7 is Mickey Mantle, #8 is Yogi Berra, #9 is Roger Maris and #10 is Phil Rizutto. And they have the effrontery to give some error prone ss #2? In Jeter's first spring training game, the equipment manager asked Showalter, then the manager of the New York Yankees, what number he should assign Jeter. Something in the 60s for the kid? "No," Showalter said, "give him No. 2." The equipment man was nonplussed. After all, only the greatest Yankees get a single-digit number. "Don't worry. He is going to be special," Showalter assured him. And here's a nice story from Yahoo Sports about where Jeter rates compares to the Yankee greats of old. Spoiler Alert Babe Ruth is still number one.